It’s funny how things change when you marry a vegetarian. I came into our relationship with no intention of ever giving up my carnivorous ways. And while I’ve held onto them, I’ve cut down on my meat intake. Considerably. 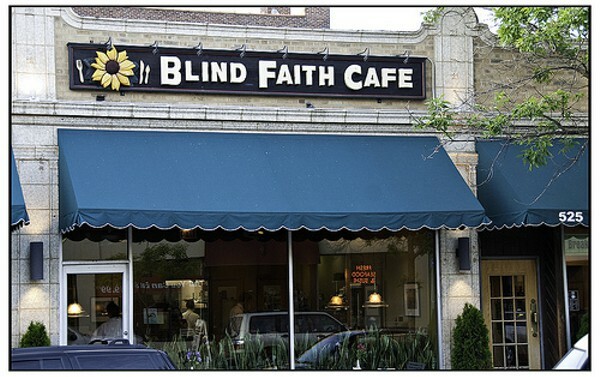 Which brings us to Blind Faith Cafe, a vegetarian restaurant in Evanston that my beautiful bride and I went to on a recent Tuesday night. Can it be called a greasy spoon when there’s no animal fat on the premises? I walked in expecting bamboo floors, walls made from recycled newspapers, glass bottles and tree sap, and three liberal arts majors powering the place by pedaling stationary bikes. Instead, it looked like a diner, complete with plastic plants, drab wall hangings and mute-toned walls. The perfect place for a Sunday morning shortstack of pancakes with Grandma. Now, don’t get me wrong; I applaud this design choice. So many vegetarian and vegan places I’ve visited seem to scream WE’RE PROGRESSIVE! Blind Faith’s decor was nostalgic. It told me I was about to get some yummy comfort food. Since I began dating my wife and trying meat-free meals, I’ve found that I really like portabella mushroom sandwiches. And I’ll tell you why: they’re kind of like a cheeseburger. That is, they’re a good delivery device for melted cheese and mustard. 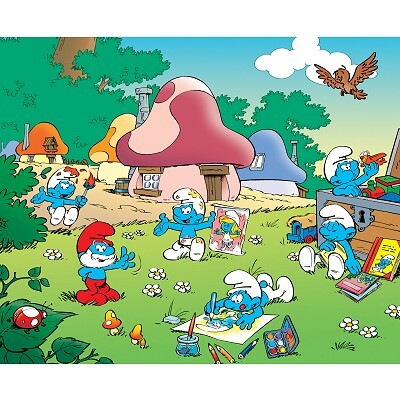 *Not to be confused with Smurf Village, though they look very similar. But I’d still go back. There’s a lot on this menu I’d like to try. I can see the wife and I coming back for years to come, perhaps with our grandkids for a shortstack (whole-grain and organic syrup, obvs). Hold tight. I’ll get to Blind Faith in a moment. Before you start feeling sorry for my poor meat-deprived husband, let me tell you what I caught him eating for lunch last weekend. A sandwich called the Fat Brewer™. The ingredients: chicken fingers, gyro meat, mozzarella sticks, French fries and tzatziki sauce, all stuffed inside two huge slabs of white bread. I mock because I envy. Do you know how many times I’ve been served steamed veggies and white rice because there are no vegetarian options on the menu? Even at my favorite restaurants, I’ve become totally accustomed to choosing between two or three options. I don’t mind; it’s comforting in a way. The truth is that I love nasty diner food. Philly cheese steak, reubens, gyros, French dip. Bring it (veggie-style, of course). Because of this, I very much enjoyed Blind Faith’s Barbecue Seitan Sandwich, even if it was my second choice (they were out of Mongolian stir fry). Overall, I thought the experience was alright, but not particularly impressive. They serve a niche, and I appreciate that, but they do it in an uninspired way. Like I said, I enjoyed my sandwich, but that’s because I never get to eat barbecue. The side salad was wilted, the ambiance was boring, and the service was mediocre. I spend a lot of time trying to convince people – with my words and with my cooking – that vegetarian food is filling and flavorful. I’ll definitely give Blind Faith another chance, but if they don’t have my back next time, it’ll be the last time. My apologies to our grandchildren. This entry was posted on Monday, October 25th, 2010 at 8:36 pm	and is filed under Evanston, Vegetarian. You can follow any responses to this entry through the RSS 2.0 feed. You can leave a response, or trackback from your own site. anybody been to the Stew in Chicago? Great food. So glad to have moved here. A lot of incredible restaurants. Have you tried Soulwich yet? It just opened in Evanston about a month ago. I’ve been working here for a few weeks and honestly I look forward to coming to work because my delicious dinner that awaits. An array of vegetarian sandwiches with seitan drizzled in exotic sauces. Its not like Potbelly where theres one vegetarian sandwich that mostly consists of lettuce. A REAL VEGGIE SANDWICH! You should definitely stop by!